Winter was the only season we could be together. Perched on the top of the hill, the spot where we first met, I painted the landscape every Sunday. The majestic presence of the ancient mountains, watching over us like Gods. The valley with the houses, so tiny from up here that we imagined they were for the fairy people. The sheep dotting the hillside like fallen clouds. It didn’t matter that the landscape had barely changed in all these years – a few more houses here, a few less trees there – she loved to see my paintings. They showed her what she could never see: the wash of green grass in the summer, growing proud and tall in the blinding afternoon sun. The fields of heather rolling across the valley like a purple ocean in the spring. The fiery palette of autumnal trees against a clear azure sky. And so I painted, every week since that first winter. I loved her, when we first met. We were closer in age then. Her milky skin and diamond eyes enchanted me. I was barely a child myself at nineteen. We stayed up all night in those early winters, thirsty for each others company. We traded stories and bashful glances. A sudden smile, the quick brush of fingers against fingers. The painful awareness of the first drip of a melting icicle upon the window pane. The snow drifts receding from the cabin door, taking her with them, away from me. We lived and we died in the span of every winter. I love her, still. But it’s different now. Love is like that. Like the seasons, it blossoms, it thrives, it changes. Sometimes it dies. But not for us. I change, too. My skin is dry and lined, like the fallen leaves that crumble beneath my boots. My hair is grey like the sky when it weeps. My limbs creak like the aged oaks in the wind. I change, the seasons change. She does not. And so it has been and so it shall always be. The seasons will come and go, and so will I. One winter, she will return and I will not. Maybe she will find someone new, maybe not. Maybe she will weep for me, those silent crystal tears. Maybe not. Winter may take but it also gives. So I stand on that hill where we met, the first snow settling on my sloping shoulders, and wait as I have always waited for my snow child. I’m also in the process of revamping my website, so I’m not going to write about my trip right now – but I will later! In the meantime, enjoy one of many, MANY photos I took on our trip..
She opened her eyes to darkness. For one heart-stopping moment, she forgot. She was drifting, a disembodied essence of what she used to be. What did she used to be? Was she ever anything other than what she was now? What was she now? She was nothing. There was nothing. Only darkness. Remember, Leya, a voice in her head urge. Grandfather’s voice. Like a rush of blood to the head, it came back to her. Grandfather. Remember what Grandfather told you, Leya. Her mind struggled against her, fighting to drift into the darkness, but she repeated the words her grandfather had told her every night since she first volunteered to go into the Middle. It will be like drowning. You’ll want to let go, to sink into the darkness. You’ll want to forget. Remember to swim. Remember to stand. Remember to think, to feel. Remember. She thought of her body. The weight of it, the pull of gravity as she moved. She thought of the solidity of the flesh that contained her muscles, her bones, her heart, her mind. She was made of mass, she was more than the darkness. Like a limb waking from a numb sleep, her body began to tingle in that painful way that shoots through the body with the slightest movement. She focused on the pricking of those needles and willed feeling into every inch of her body. Her face, her arms, her legs, her fingers, her toes. She couldn’t see in the darkness, but she envisioned her body as she had seen it in the mirror every morning. Long honey-blonde braid. Bronze eyes. Scar from her right temple to the corner of her mouth. She’d been instructed by her grandfather to study her reflection every morning, to commit every detail to memory. She wore the same outfit: a plain grey tunic tucked into brown breeches and her brother’s leather boots from when he was young. A hunting knife hung at one hip and a satchel of medicine and food at her other. They didn’t know what she would find in the Middle, or what condition her brother would be in. Jerin. I have to find Jerin. With a jolt, Leya felt the gravity return to her body. She blinked and the darkness seemed to shift from an all-consuming black to the deep greys of a moonless night. She managed to sit up and raised her hand before her face. She stared hard at the space where she knew her hand to be and imagined that she could begin to see a pale shape. The adrenaline coursing through her body was causing her to shake. She took a few deep breaths, but was afraid to close her eyes again, should she lose what little adjustment her vision had made. “Swim, Leya. Stand.” Her voice sounded strained and distant to her, like when her ears filled with pressure when hunting high in the mountains. Still trembling, she shifted to get her feet under her, disoriented at the lack of sound as her boots should have scraped across the ground. There was no sound in the Middle, except that of her own ragged breathing. And I am dead. The thought disoriented her and she could instantly feel her body begin to break-apart and drift. The darkness swept in like a predator, pressing at her from all sides as it tried to steal her from herself. She clenched her fists and willed herself whole again, clinging to her sense of self and physicality. You are dead, but only temporarily. Your body is with your grandfather, she reminded herself. He is watching over you. He coaxed you into this temporary state. He will bring you back. But first, you have to find Jerin. You have to bring him back with you. Feeling a surge of strength and confidence, fueled by the urge to get the hell out of the Middle and back to the land of the living, she lifted her head high. “I am coming to save you, Jerin.” She took a step forward into the darkness. A paper illustration of Jack the Ripper I did in college. I used layers of cut paper to create the image, each sheet a different color. This is the only illustration I’ve done in this style, but it won me 2nd place from the Pittsburgh Society of Illustrators in a student show! I’d like to do some more in this style. Even though it was a lot of work and cutting out tiny pieces of paper, the end result is worth it. Take me to my happy place. 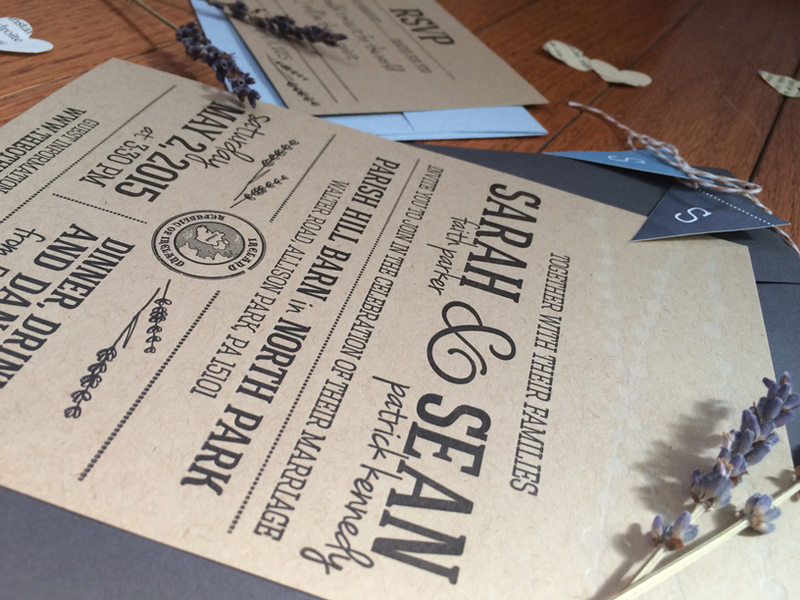 In an attempt to actually finally start being more active in sharing my art and design work, I thought I’d share some work.. and since it’s Valentine’s Day, why not share wedding invitations I designed.. for my own wedding?! 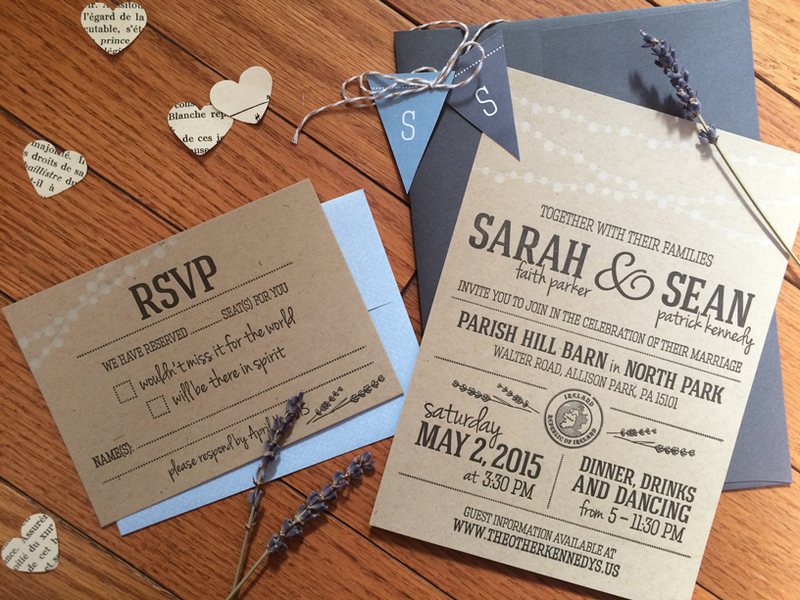 These were printed on kraft paper with two color letterpress (black and white). 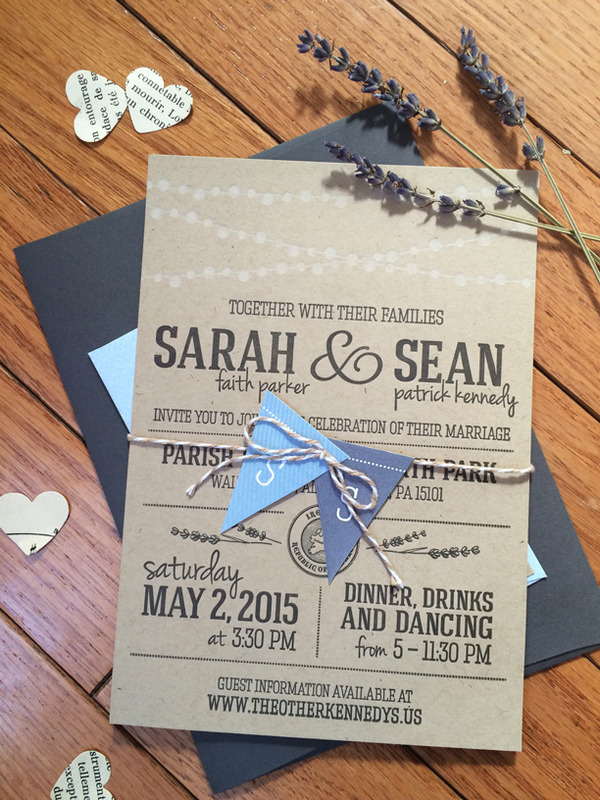 Our theme was rustic Irish and our colors were dark grey and dusty blue. The little paper confetti hearts (stamped from old French books.. ooh la la!) and dried lavender were actually a part of our wedding decor as well, I just happened to have some left over to decorate these photos with.